Two year-olds are incredible learners and have adventures every day. They are learning so much; from expressive language to potty training. At Home Sweet Home Child Care, we’re engaging their young minds with a blend of education components. Our programs include music activities, art and story time. We facilitate building science knowledge including the differences between day to night, different types of weather, and constructing short and tall towers in our block area. 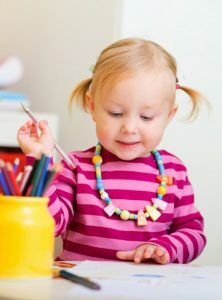 They develop listening skills and complete simple two-step tasks. Children of this age group (Two Year-olds) at Home Sweet Home Child Care improve running skills and begin to jump, hop and leap. They begin to discover how to count, identify numbers and letters, and name basic shapes. 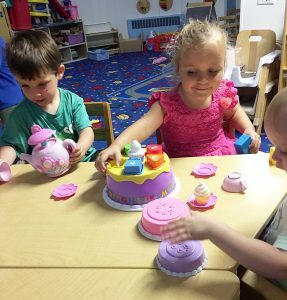 We provide a variety of group activities to help children to make good friends and practice fundamental social skills such as cooperation, sharing and taking turns. Our environment has a well planned learning center that allow for child choice play and small groups, with supportive teachers that encourage optimal development and happy, relaxed days.